The only thing scarier than being a monster is babysitting one. 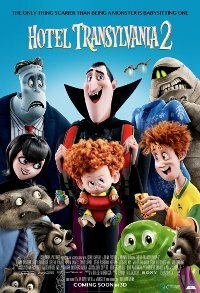 In the second episode of the series, everything seems to be changing for the better at Hotel Transylvania. Dracula's rigid monster-only hotel policy has finally relaxed, opening up its doors to human guests. But behind closed coffins, Drac is worried that his adorable half-human, half-vampire grandson isn't showing signs of being a vampire. So while Mavis is busy visiting her human in-laws with Johnny, Drac enlists his friends to put Dennis through a ''monster-in-training'' boot camp. But little do they know that Drac's grumpy and very old, old, old school dad Vlad is about to pay a family visit to the hotel. And when Vlad finds out that his great-grandson is not a pure blood (and humans are now welcome at Hotel Transylvania) ... things are going to get batty! This film is releasing in 2D and 3D, this is the 3D version. Parental Guidance 7-9 (Violence, Horror). You look just like your daddy!